While at USF, Daragh Gibson completed a Master of Public Health (MPH) in Global Health Practice and a Master of Science in Engineering Science (MSES) in Environmental Engineering. 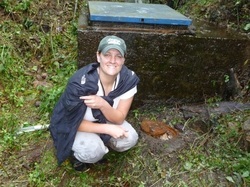 She served as an Environmental Health Volunteer in Panama as part of the Peace Corps Master's International Program, where she worked to increase sanitation coverage in her community through a composting latrine construction project. Her thesis is titled “Inactivation of Ascaris in Double-Vault Urine Diverting Composting Latrines in Panama: Methods and Environmental Health Engineering Field Applications".